Cheer up Crazy Cocker Spaniel or you will get coal in your stocking instead of chicken strips. 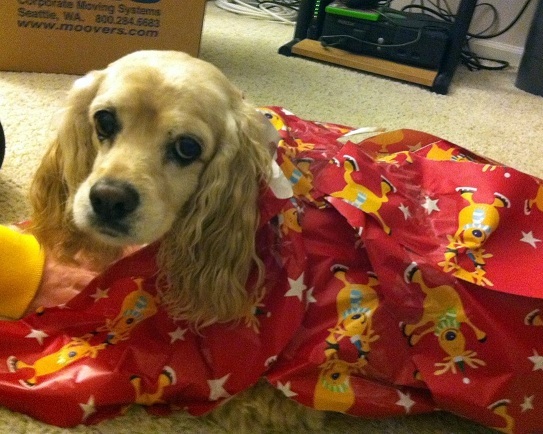 🙂 And in case you were wondering it isn’t easy to wrap a cocker spaniel in paper but I am going to guess it’s much easier than a cat! There is a youtube video on wrapping a cat. Very funny. Looks like CCS had a fair amount of patience. Thanksv forv another year of great recipes. May 2012 bring you health, happiness and MANY new recipe ideas. even easier if you make a paper tube. like an octopus trap: you put a pot there, go away, and when you come back, you have an octopus in a pot. unwrapping a cat is probably more troublesome as well as dangerous. i love these pictures! happy holidays! !